Even though it’s evident that cabin fever is rapidly rampaging into full-blown spring fever here at Studio Chic, the temperature reality of the Pacific Northwest is in what is know as February Fake-out. And I’m still on a top-down Stockinette Stitch bender! My lovely natural “black” Cormo sweater is blocking (pictures soon), and I’ve started another deep-stash project. This time out, I’m designing a top-down, chunky (4st/in) gauge sweater that I hope to wear gardening and hiking in the woods. The Yarn: Rowan Scottish Tweed Aran that I’ve had forever – now discontinued – which is a really rustic, beautifully colored fiber in a deep navy popped with white, grey & cobalt nubs. The Problem: the receipt from years ago (wow – 2008) says I have 8 balls, but I can only find 7. Hmm… This is a wrench-in-the-works because the comfort zone of my project has just evaported into the chill late winter air. 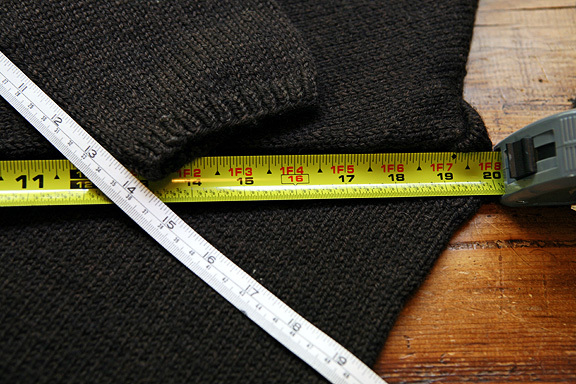 I want to make a size slightly larger than I normally wear, for comfort and to accommodate the larger gauge, with a length of about 29″, pockets AND a generous shawl collar. But do I have enough yarn? While working my mystery yardage Cormo sweater, I worked segments of the sweater, putting some areas on hold partway through their creation (the Body) and then knitting other important segments (the Sleeves). I knew I had enough yarn for an entire sweater but I wanted to make its Body as long as possible. The sweater had a built-in button band, so once the Sleeves were complete I could confidently just knit the yarn until it was gone. Working this way, I could track the yarn usage and adjust #4’s length to make sure I could at least complete #5. Since starting to bake serious sourdough bread, I’ve acquired something no kitchen (or knitter) should be without: a inexpensive scale. This tool will be the keystone to figuring out if I can bring my project to the finish line. It will enable me to find a basis to keep track and distribute the use of the actual balls I have across the garment. What information does the scale help discover? Well, the most important: how much length is used per weight. 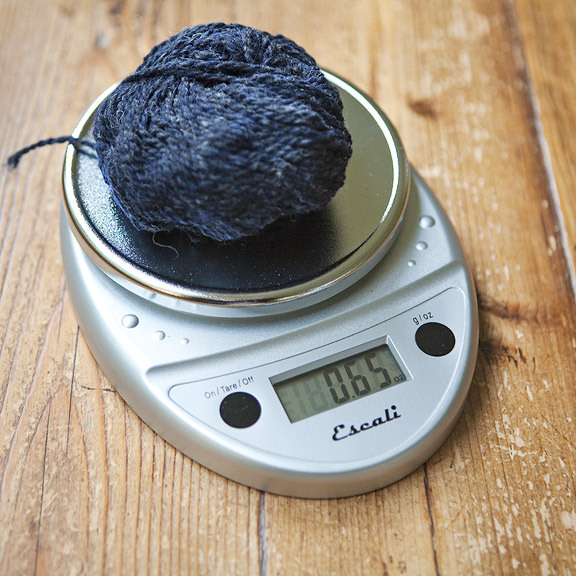 With that data, and the given yardage put-up of the yarn, one can figure out how much area and length you can expect to get from each ball and scale its usage accordingly. This particular yarn has 186 yards per 100 grams. Now a more sane person might’ve taken this one step further, and if you’re interested in really understanding the A-Z of this, I encourage you to try this: make a large swatch and keep track of stitches and rows worked at your desired gauge. Then: weigh the swatch, and divide it by the number of total stitches made (stitches per row TIMES number of rows worked). This will give you the length of yarn used per stitch, which can be a very useful piece of information in this process. But because I’m an adventurer, I just cast right on and I am going to keep track of the number of stitches worked on the Yoke as I go through the first ball of yarn (with pencil and paper), using the same concept as above. 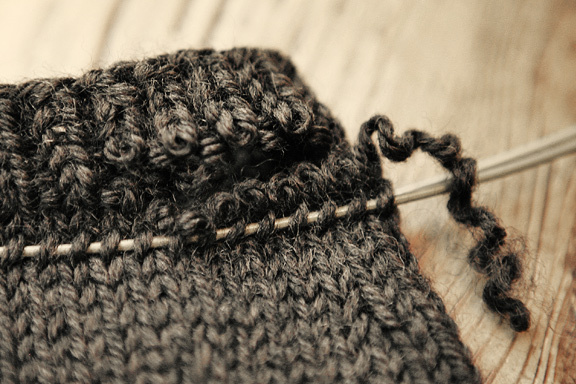 Doing this, I find that I am using approximately 1″ of yarn for every stitch worked. Sweet! An easy nice number! I will call this data into play later on in the garment. 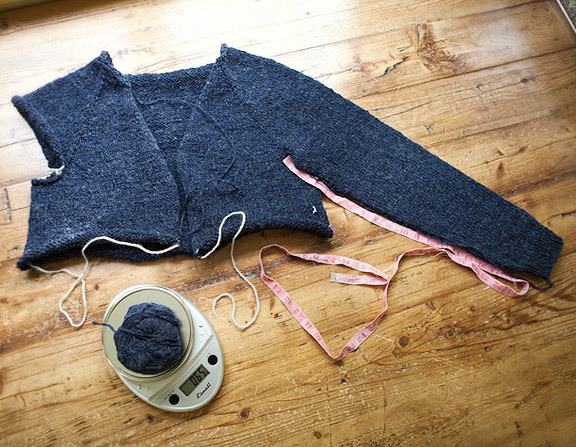 Now the second ball of yarn I’m using takes me through the Yoke divide (where you put the Sleeves on hold in top-down construction) and now the Body is basically a rectangle and it’s very easy to keep track of that important “stitches worked” count. 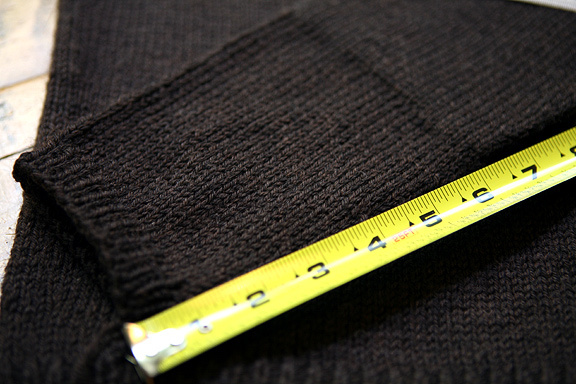 My initial estimate of 1″ per stitch checks out again and I put the Body on hold and start working the first sleeve. My most scary segment of this design is the Shawl Collar/Bands. It is the hardest to guesstimate area and yardage. The longer I make the sweater, the more yarn it will take to band it. I’m hoping to gain a little more confidence by completing the Sleeves and having a little leftover yarn for insurance. Eyeballing the Body section I’ve worked already also helps – I can visualize the collar/bands within its area and know it’s probably going to take at least a ball. After I’m done with the first Sleeve, I now go back to my scale and weigh the remaining yarn. The leftover ball weighs .65oz. I know I have 52.8 yards per oz – so that’s about 34 yards. So, from the two sleeves, that means I’ll have 68 yards extra. While working on my lovely *black* Cormo Cross sample sweater, I reminisced about another deep deep expresso-colored cardi that was in my wardrobe. Although it was made from some of my favorite fiber (Jo Sharp DK), it was sadly, languishing on the shelf. In fact, I couldn’t remember the last time I wore it! What would make me shun such a lovely sweater? Well, one of the characteristics that made me love the yarn also made me avoid wearing that style. The fabric that this yarn produces, at a DK gauge, is very dense. 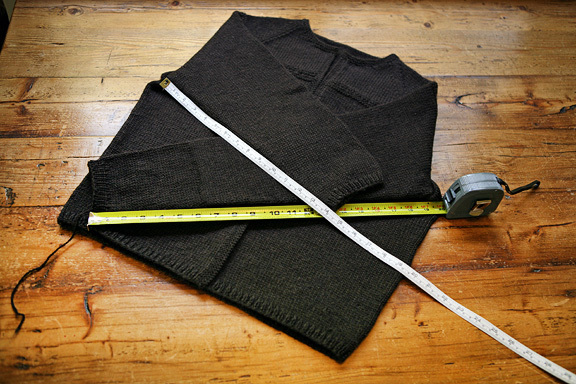 This results in a garment that is also dense, thick and WARM. This particular style has 3/4 length sleeves. So, while enjoying the sweater during cold, cold weather, the torso receives a nice COZY HUG while the lower arms are conspicously suffering a CHILLY POKE from the uncovered area, almost elbow to wrist. Loving this yarn really got me going though, when I remembered, having recently moved, that I had packed a couple of small balls of it in my stash. Would I have enough? I weighed them and decided to go for it, it seemed OK! Why let this lovely sweater go to waste? These sleeves were knit in the round, but from the bottom up! So it wasn’t possible to frog the sleeve from the ribbing and add some length. 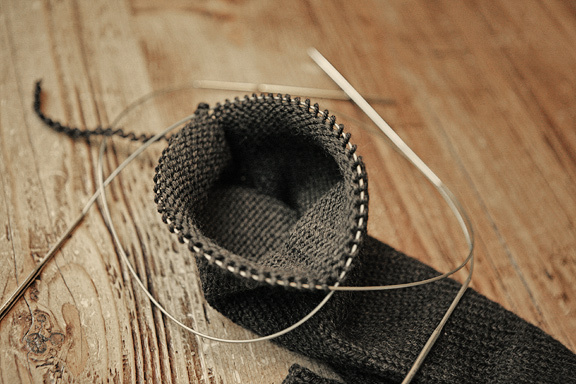 If you’ve ever tried this (I did in my early knitting days – whoa!) you know that the stitches are completely intertwined in a way that requires you to pick them apart one-by-one instead of just *un-zipping* them if you want to free them up. So, I was going to have to first replace already worked stitches either on a needle or scrap yarn and then CUT THE FABRIC. Yes. Thrilling. I like to knit in-the-round with two circular needles on larger tubes so my plan was to pick up half the new stitches on each needle and go from there. Starting one row down from the ribbing and using the tip of one needle, I picked up stitches through the next row, entering the stitches on their right side, from the rear of the stitch. The first stitch picked up was the one I thought was the closest to what was the beginning of a round of the original sleeve. 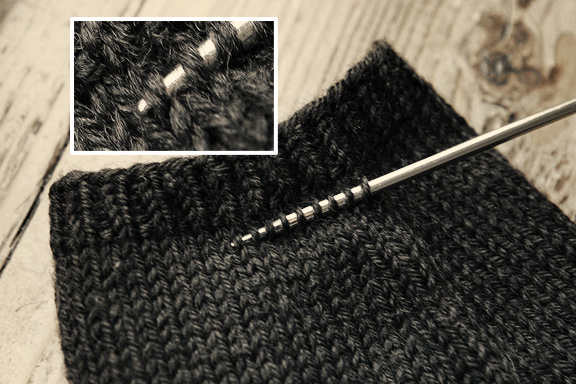 This puts the stitch in the exact correct alignment to knit it later without twisting or re-positioning. After I placed the entire row of stitches on the two circular needles, I made a snip near the start of the round, on the first ribbing row. 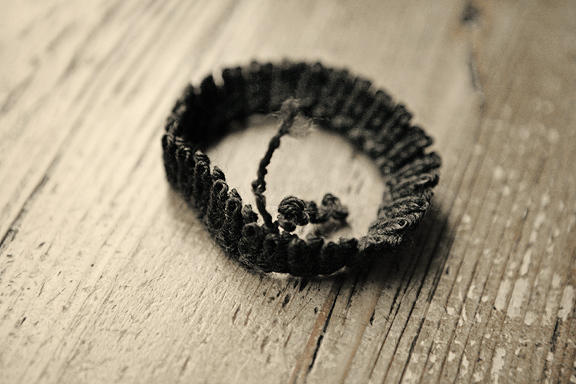 Carefully, going slowly, I pulled the tail of the yarn through the ribbed stitches, all the way around. This leaves a row of “live” stitches above those being held on the needle. Why do it this way? I’ve found it’s easier to find and fix glitches if you’ve accidentally gone one row up (or down) through the fabric while picking up the stitches. If I had been close to running out of yarn, I would subtract the weight of the 1st ball used from the 2nd ball. Then I would divide the remaining weight of the 2nd ball in half and wind off a portion weighing that much, to finish on Sleeve #1. This leaves the right amount for Sleeve #2. VOILA! Now I have a comfy deep expresso cardi to wear and tide me over until that sample is finished! A girl can NEVER have enough yarn or sweaters, especially in such a yummy color!